Post-perimeter security is a new approach to enterprise security centered on the protection of corporate data when accessed by devices outside the reach of traditional perimeter-based security. It is a security model for the modern, perimeter-less, cloud-delivered, and privacy-focused world. Learn more about how Lookout delivers our post-perimeter security solution. Central to our post-perimeter solution is the Lookout Security Cloud, which leverages a data-driven approach to detect complex patterns that indicate known and novel threats, software vulnerabilities, and risky mobile behaviors and configurations. Find out how your organization can best leverage Lookout’s platform by exploring our products below. Solutions for your mobile workforce. Providing comprehensive and continuous assessment of risk across iOS and Android devices to secure against app, device, and network-based threats. Lookout Continuous Conditional Access enables ongoing visibility into the health, identity and context of the device. With continuous risk assessments, Lookout actively protects connected endpoints with the ability to dynamically stop access as soon as a risk is detected. Stop threats before they start. Protect your end users from new and emerging phishing attacks beyond your existing perimeter solutions. Lookout inspects all outbound connections on a device and blocks access to malicious links across corporate and personal email, SMS, messaging and other apps on the device. Now available to our Mobile Endpoint Security customers. Solution for securing consumer-facing apps. Lookout App Defense leverages the power of the Lookout Security Cloud to offer the most secure and easy to deploy solution to protect individuals and organizations from data compromise when conducting transactions via mobile apps. Solutions for your personal devices and data. Lookout Personal provides protection against mobile threats such as malware, device compromises, unsafe wireless networks and malicious websites. Lookout secures your personal information and your mobile life with integrated identity theft protection. Lookout Personal provides protection against mobile threats like malware, identity theft, and device theft. Wide adoption of our enterprise endpoint and personal products gives Lookout visibility into over 170 million mobile devices worldwide. We’ve acquired and analyzed over 60 million unique mobile apps, and track them in real-time across our global sensor network. Millions of devices in over 150 countries send security telemetry to the Lookout Security Cloud, ensuring that Lookout sees evolving threat actors first, and continues to lead the industry in novel threat discoveries such as the Pegasus and Dark Caracal. One platform, the Lookout Security Cloud, powers a wide range of solutions spanning mobile threat defense, vulnerability management, phishing protection, threat intelligence and beyond. The Lookout platform offers the deepest and most comprehensive set of security capabilities, at scale, driven by artificial intelligence leveraging our massive dataset. With industry leading AI and a rich patent portfolio, Lookout is the leader in detecting and remediating zero-day and known threats in a post-perimeter world. Only Lookout enables a continuous risk assessment of endpoints that operate outside the reach of traditional perimeter based security tools. Continuous conditional access provides the necessary visibility into the health of devices connecting to sensitive corporate data. Our ability to dynamically allow or block access, gives organizations the ability to build policies that define how users connect to the enterprise on devices that are not often beyond the reach of IT. Lookout combines cloud-based detection informed by millions of endpoints with leading on-device security to deliver continuous risk assessment of an endpoint. Whether connected or off line, Lookout provides the ability to detect and remediate threats using a hybrid approach to cloud and device based security. Techniques that heavily rely on on-device detection are inherently less secure because attackers can inspect and evade them. These techniques also negatively impact device performance and battery life. Lookout makes such compromises unnecessary by optimally combining cloud and device-based detection, and a privacy-by-design approach. Comprehensive protection across the spectrum of mobile risk. The need for organizations to have mobile threat defense in place has never been more clear given the sophisticated string of attacks seen recently on both Android and iOS devices, perpetrated both by private organizations and nation states. Software vulnerabilities can exist across all layers of the mobile environment and they raise the risk that critical mobile software and hardware can be exploited by attackers to steal data and attack organizations. Outside of mobile threats and software vulnerabilities, a wide range of mobile environment configurations and behaviors, such as app data leakage, can nonetheless elevate an organization’s risk profile. 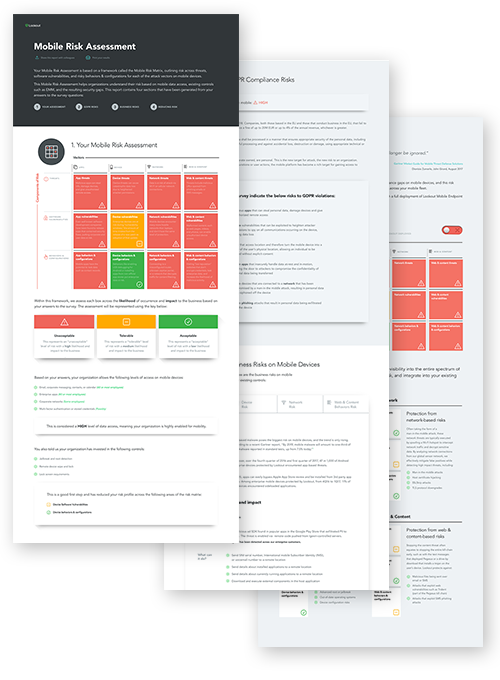 Complete this online mobile risk assessment to get insight into your current level of mobile risk based on your mobility policies and existing controls such as EMM. This assessment is based on a framework called the Mobile Risk Matrix, outlining risk across threats, software vulnerabilities, and risky behaviors & configurations for each of the attack vectors on mobile devices. Get a custom assessment of GDPR and business risks to personal data by answering 20 questions about the state of mobility in your organization.